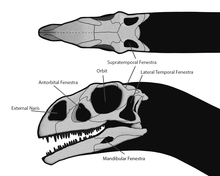 The lateral temporal fenestra in relation to the other skull openings in the dinosaur Massospondylus. An infratemporal fenestra, also called the lateral temporal fenestra is an opening in the skull behind the orbit in some animals. An opening in front of the eye sockets, conversely, is called an antorbital fenestra. Both of these openings reduced the weight of the skull. Infratemporal fenestrae are commonly (although not universally) seen in the fossilized skulls of dinosaurs.